North Star Cruises was the first permanent and is now the longest established charter cruise operator to cover the vast wilderness of the far north of Western Australia. Owner Craig Howson has been leading exploration, diving and fishing cruises in the region since 1987. The company specialises in live-aboard wilderness cruises along 2000 kilometres of Kimberley coastline and coral atoll cruises at the Rowley Shoals - three atolls perched on the edge of Australia's continental shelf, 300 kilometres west of Broome. 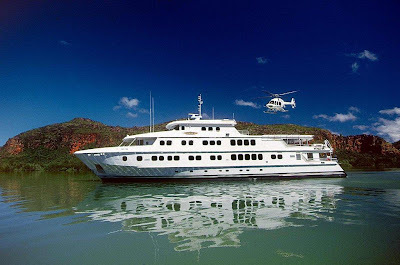 Now based in Broome, the company commenced operations in Fremantle, Western Australia, in June 1985, placing an order for a 15 metre launch, North Star surveyed to carry 6 passengers and 2 crew for overnight charters and 14 passengers and 2 crew for day charters. In April 1987, Craig Howson decided to seek work in Broome. There, he began day fishing and diving charters with demand soon growing for longer cruises. His company initiated the first live-aboard charters along the Kimberley coast and to the Rowley Shoals. In the 1987 season, Craig chartered three ‘True North Wilderness Cruises’ and three ‘True North Coral Atoll Cruises’ dive trips. Market demand for North Star trips soon increased, so in April 1991 North Star IV was launched… and in September 1993, a new 70-foot luxurious vessel, True North, was launched to accommodate 14 passengers (10 comfortably) and 3 crew for overnight charters and 22 passengers and 3 crew for day charters. In 1998, to meet market demands for increased occupancy, comfort and further exploration, another vessel was launched. However the companies most recent vessel, launched on Thursday 25th November 2004, is by far the most impressive. The ship, again called True North, was built by Image Marine, a division of Austal Ships, builders of Greg Norman's Aussie Rules. At a cost of $12 million, she represents the largest single investment in Western Australia's marine tourism industry and is now yours to enjoy.